Exactly one year ago, I got to go to my very first photography conference/workshop. More importantly , I got go somewhere without my kids for three days and I was ok with it. BUT THAT'S GOING TO BE A WHOLE OTHER blog post. Being a photographer is important to me and I'm always looking for ways to improve my abilities any chance I get. Two years ago, I came across I heart faces and saw that they have a conference /workshop but it was down in Dallas and at the time, I didn't have the resources to get me there. Fast forward to 2013 and my friend Michelle over at Callia's Corner and Michelle Montero Photography asked if I was going and that it was in Ohio. It was half way between the both of us. I looked it up and the airfare to Ohio was totally affordable. I told her yes and since she already had booked a room, we would be roomies. I don't know why I was more excited, that I had kid free time for three whole days, I would meet an awesome bloggy friend that I had made in person or that I got to be in a hotel with hundred or so women who loved photography as much as I did. I was soooooo excited. I have to say that I didn't' take a many photos as others that attended the conference. I was so busy taking in everything that some of the time I barely even took notes. I was just soaking it all in and trying to learn as much as I could. We got there early on Friday and had some time to explore cute little Granville, OH. Cute little town with a college, bars, deli, a some shops and restaurants. It was almost the most perfect little town I had ever seen. Gorgeous old houses and a quaint main street. Friday night was the mixer/ meet and greet. So we got on our best pair of jeans :) and went down to meet some other photographers. They had a great bar and snacks around the room. Also , two different photo booths were set up to take some silly pictures with your new friends. Let's not forget the DJ. It was just like a regular wedding reception, all women on the dance floor having a good time. Saturday morning we got started with a great breakfast and then on to our many sessions that we could choose from. Some we needed reservations for and some we didn't. There were six class sessions that you could attend. The first session I chose was "Using Reflectors & Diffusers in Your Photography" with the rep from Wescott. She went over how a 5 in 1 reflector can really enhance your images and your session. They can get rid of harsh shadows and help your clients to not squint as much. They really looked like a good idea but I'm still trying to get my images straight out of camera as awesome as they can be and right now I don't need to worry about where to put the reflector. 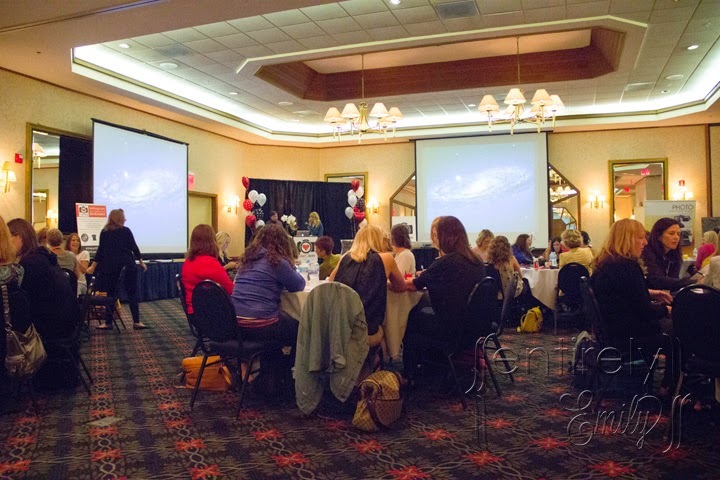 My second session was "Simple tips to Improve your Photography Today with Angie Arthur , co-founder of I Heart Faces. Ok, let me start by saying that she is just as nice as she looks and as someone else at the conference said...she has the most amazing mermaid hair. I hope that K's hair looks like hers some day. She talked about 12 Simple Tips that we could do to improve our photography hence the title of the session(duh) Things like turning off your flash and take the time to find the good light. Some were basic and some maybe you just didn't take the time to think about. The third session was one of the RSVPs "Finding the Light with Julie Rivera". She was so funny and really showed us how to find the light no matter what time of day and what the weather was like. I even was snapping pictures of her as she described how to find the light. And she caught me a couple of times. Hey, I was practicing. After she was done talking, we split up into pairs and tried to practice what she was preaching. I got to pair up with none other than Jessica Paige from One Willow Presets. Of course at the time, I didn't know who she was, but when she knew a lot about my camera and the way the light was working under the trees.... I figured it out real quick that she was a professional. She was so patient and kind with me. Finding the light is something that I am still struggling to be able to do consistently. Session number 4 was "Using elements of composition to Create a stronger Image with Dana Suggs"
Ok, Dana is a total hoot. I could sit and listen to her talk all day , or go shopping, or have a drink as she imparted her wisdom. During her session, if she asked a question and you got it right, she threw you a candy bar. We were all trying to be really smart that hour :) Just to give you an idea of my first impression of her, Friday night there was a "dream big "chalkboard that we were supposed to write our big dreams on. I saw one that read " I want to pee alone." I laughed and said "Now, there's a lofty goal." to which she replied" Hey, now." Session 5 was "Capturing Children's Natural Smiles with Jennifer Tonetti-Spellman" . This class was so eye opening to me. She told us to really engage the kids. Don't' stop moving. Don't be afraid to be and act crazy. Say things that will make them laugh and do things that will make them relax with you. Kids are more natural when they have something to do and react to. I was so busy running after her that the only picture I took was of her taking pictures. I really hope I can have the connection that she has with her clients but with mine own clients someday. Finally, our keynote speaker was Tamara Lackey. She spoke for a few hours about how it IS about the Money. Maybe I'm not as far along in my business to get all of what she she said because alot of it went over my head. It could have been that I was flipping starving by now or tired but the gist of what she said was...Don't think of money as a bad thing. If you don't welcome it in, it won't come visit you at all. You are being a creative being and you deserve to make money from your creativity. You should get paid for time away from your family and for your efforts. I know she said alot more than that but that's what I got from her talk. All I know is after that Michelle and I ran to the nearest bar/restaurant in town and some food and some beer. We.....were....starving. Stay tuned for part 2 with some more gorgeous photos. I am so glad that you flew in for the conference, Emily. It sounds like your day was filled with a lot of great learning experiences! I am really happy you had such a wonderful time. We had a blast Emily!! I can't wait to hit up Shutterfest in April!